>How do you make a game adaptation of a film or novel? When we watch a film made from the bones of a beloved book, we ask only (!) that the film recreate faithfully our fondest memory of reading the book. But that fidelity rarely works in a game — the enjoyment of a game is based on different aesthetic experiences. A game that too-faithfully rendered a familiar novel or book would be, well, boring. So I was intrigued by how Matches and Matrimony would explore Jane Austen’s most famous novel, Pride and Prejudice, which has been adapted to films (and other novels, if you count Bridget Jones’s Diary) many many times, sometimes even with zombies. 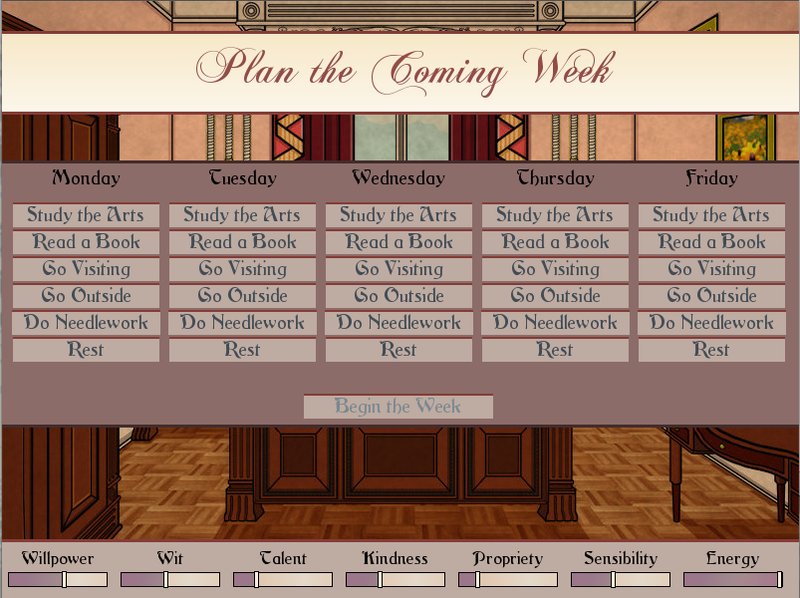 The game is a fairly standard dating sim in structure, with an attribute leveling system which determines what interactions are available with which characters during the course of play. Once a cycle (a week in the game) you select activities that raise certain attribute scores, then participate in narrative scenes during which you can make some dialogue choices or take an action. 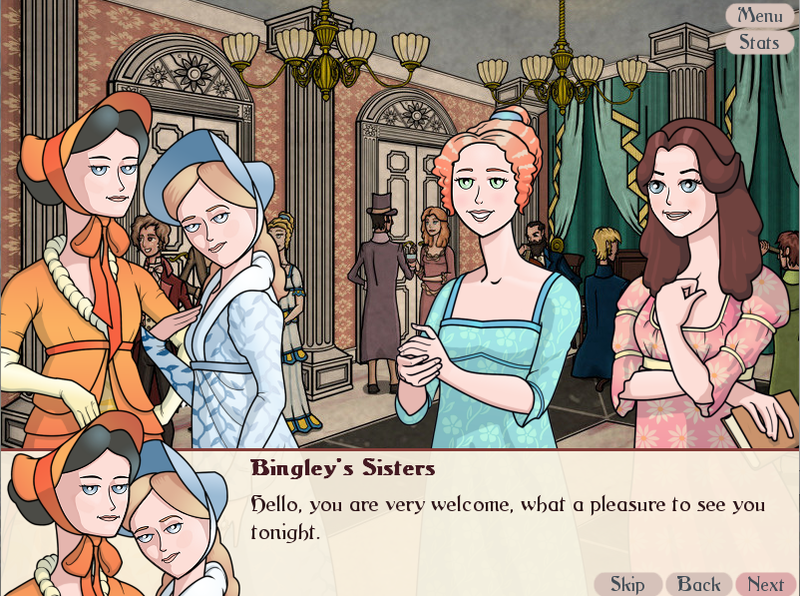 The game falters most when (and I can’t believe that I, the consummate Jane Austen loyalist, is saying this!) it tries too hard to cleave to the novel. Entire scenes of dialogue are lifted directly from Austen’s text with no editing — delightful to read in a book, deadly tiresome on a game screen. The game sparkles when the writers insert their own dialogue, especially the inner monologue for of the main character, Elizabeth Bennet. The game gets considerably more fun when it diverges from the novel, opening up new romantic possibilities. However, since every one knows Lizzy is meant to be with Darcy, following other romance paths is not as exciting as it ought to be. I enjoyed the game; but it really drew my attention to the difficulty of adaptation and reinforced my instinct that it’s not advisable to do a narrative adaptation of a film or novel — it’s not fun to play a pattern that is so obviously predestined. Rather, you want to feel that you are playing the the author’s world, but perhaps with your own rules and your own choices.